**Applications: This model is not meant to be built-in to cabinetry, recessed or put underneath a counter. Additionally this model is not meant to be used in an enclosed area. While the back of the unit does produce a minimal amount of heat, it still needs to vent to an open area. can you get parts ( circuit card ) ? BEST ANSWER: Yes, The unit stopped cooling and Wine Enthusiast sent a replacement card. It required two solder connections. Working fie. Can temperature be lowered enough (37) to store perishables like milk and cheese? 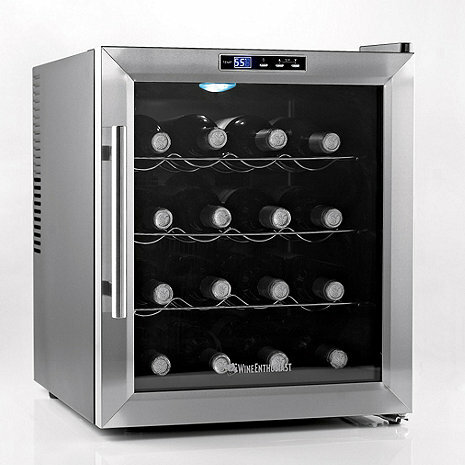 Hi, please, how many amps is the Thermoelectric module that use this model of wine refrigerator? Thanks. Hi, I am referring to the thermoelectric module, greetings. Ssorry, I cannot answer. It was a gift to a friend. BEST ANSWER: I purchased this as a birthday gift so the box is still unopened and sitting in my home. The weight is not listed on the box. I'm a healthy 62 year and I can lift the box and carry a short distance though. The picture shows stainless steel sides is this not correct as mentioned in one review? BEST ANSWER: Ours only has stainless steel door. Then main shell is black, sides and top. Our 272 02 17 stopped cooling. Fan and all lights and temperature control appear to be on. It will cool to 52° then stop. Any suggestions? Do you ship in province of Québec in Canada? BEST ANSWER: Please contact our sales department at 800.356.8466 and they can assist you with this. Thank you. How do you attach the handle to the door? Slide the gasket out of the way and you should see the holes to attach. If you are still having trouble please contact our technical department @ 1-800-648-6058 option #2. Does anyone know the height without the hinge? My clearance in the middle and is just about 20”; is it possible to remove the legs? I purchased this wine refrigerator for my daughter and son-in-law whose small home seems to be too hot to store wine in the summer. I read several reviews of different wine coolers and chose this one due to it's size and ratings. It fits neatly under their desk cabinet and allows them safely store nice wines. It has an attractive stainless steel front door and my daughter reports that the temperature has been very stable. Moreover, it is quiet although they do have it on carpeting. Great value for the cost. Perfect size, to hold an assortment of wine ready to pair with whatever is for lunch, or dinner. Quieter than previous model that I also owned. Photo shows this model as all stainless steel, but model sent had only stainless steel face. This wine refrigerator fit perfectly where I previously had a built in wine rack. As advertised, it is so quiet that we never hear it making a sound. I sometimes I wonder if it's even working but the wine temperature remains constant at the desired setting. I definitely recommend this product. Only holds 16 bottles, but get this, it actually holds 16 bottles. Including Turley which has one of the largest bottoms and didn't fit in other units. Only had it for 3 weeks now and holding temp so far. Lower self can hold a magnum. The wine bottles fit easily in the cooler which was not the case with our previous 12 bottle cooler. Easy to put together. We love it! Nice & roomy & keeps constant temperature. We purchased this unit to replace another 16 bottle wine refrigerator that had become very noisy. This model is attractive with the steel front and blue digital temperature display. We have it under a built-in desk in our kitchen and it fits there nicely. It is also extremely quiet and holds the temperature (58 degrees) with no problems. I highly recommend this product as an affordable option. Love this very quiet product. Excellent product and even better service. I have a very small space for a wine frig. I love this one. It is my third. It is perfect for my space and realize they won't last forever. I have used them since 2007. I don't have the best space to let it "breath" but works for me. I've only had it for two weeks and I'm very happy with it EXCEPT it is too small for most sizes of wine bottles. Not wide enough for Pinot Noir, not deep enough for Riesling nor for ANY bottle that is re-corked. I must admit to a bit of hesitation ordering a wine refrigerator without having seen the model in person, but it was a great decision. It is very quiet and keeps everything at an even chill and ready to serve. We are very happy with the product (birthday present for my husband). It's a refrigerator. You plug it in, it's gets cold. What more to say. Oh, it is quiet. Just what I was looking for. Good quality,works perfect. Looks really classy. This is a great Company that stands behind their quallity products. Don't hesitate to purchase. I like that this is a compact wine refrigerator. However, there were no directions about installing the handle onto the fridge. Another thing, when placing the wine bottles onto the shelves, the shelves become unstable if you slide them out. You need to hold onto the shelf when pulling it out half way or your wine will fall. I have it set at 55 degrees it is mostly at 56 or 57 degrees does not stay at a constant temp. the screws were not included with the handle. Is there a way that you can ship these for me? There is no way to attach the handle. Thank you. While it worked I was happy... clearly a disposable cooler.